Movistar Yamaha MotoGP’s Jorge Lorenzo secured third place on the grid for tomorrow’s Indianapolis Grand Prix in this afternoon’s qualifying session. Teammate Rossi had a challenging outing and secured eighth. 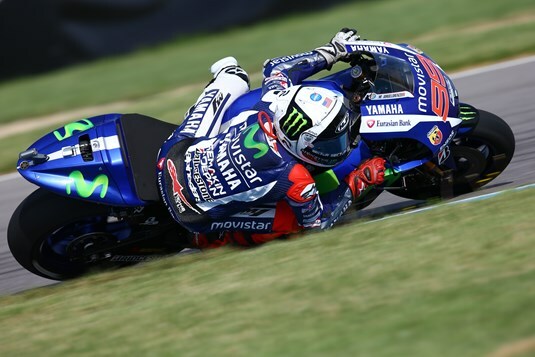 Movistar Yamaha MotoGP rider Jorge Lorenzo scored a front row position in this afternoon’s qualifying at the Indianapolis Motor Speedway. Teammate Valentino Rossi made a considerable improvement on the practice sessions, dropping into the mid 1’32’s to take eighth. Lorenzo was on typical form for the 15 minute qualifying heat, ensuring he was the first man on track as the session began. His first flying lap of 1’32.715 saw him shoot up directly to provisional pole, but his hold was short lived. As the rest of the field crossed the line, he dropped to fifth before quickly retuning to the box with nine minutes on the clock. When he returned to the track less than a minute later the pace had quickened and Lorenzo had dropped back to sixth. He responded by delivering another hot lap, bettering his time to 1’32.611 to secure fifth place on the grid for the race, but again wasn’t able to hold the spot and slipped back to sixth. He came back in to the pits for a third time with a little more than four minutes on the clock for a quick stop, to commence his final try with three minutes remaining. This time the Spaniard made it count, his time dropped to a 1’32.186 in his final push, enough to secure third position on tomorrow’s grid. Valentino Rossi endured a challenging qualifying this afternoon, as he was unable to find a set up with his YZR-M1 to challenge the frontrunners. Rossi left pit lane directly behind his teammate but came back in before completing his outlap. After a quick stop, he headed back out to set a first flying lap of 1’32.511 for third. Eager to claim a front row starting place, he gave it another try but was unable to improve and returned to the box for a second time with less than six minutes remaining. One minute later he was back out for his third outing, but despite giving his all his time was not enough to move up the grid. The nine-time World Champion will start tomorrow’s race from eighth on the third row. Monster Yamaha Tech3 Team rider Bradley Smith produced a stellar effort in the qualifying practice at the Indianapolis Grand Prix today to clinch 6th position for tomorrow’s 27 lap sprint. The young Briton began the day with a superb display in FP3 where he posted a top time of 1’32.421, which saw him finish the session in 2nd and just a blink of an eye back from the leading time by 0.029. Following this performance, the 24 year old was fully charged for a successful run in QP2. When the 15 minute shootout began, the British rider jumped onto the Yamaha YZR-M1 and burst into action before setting a time of 1’32.269 on his 7th lap which lifted him to third position. He then attempted to lower the time further, before finishing in 6th which equals his best qualifying performance of the year, with his lap being only 0.083 from the rear of the front row. Smith now fully intends to undertake a typically strong start tomorrow to be able to battle as close as possible to the factory MotoGP bikes during the 10th round of the 2015 season. Meanwhile Pol Espargaro will contest the second American round of the 2015 MotoGP World Championship from 11th on the grid after a tricky qualifying practice in Indianapolis. The Spaniard began his day with a solid performance in FP3 by setting a lap of 1’32.945 which he was due to improve further, but he unfortunately fell at the end of the practice. This meant his earlier time saw him finish the session in 8th and able to progress straight through to QP2. When the qualifying started, the 24 year old pulled the pin and set a 1’32.670 on only his second lap. Espargaro concluded the 15 minute shoot out with this time as his personal best, which will see him start the race from the middle of the fourth row, with a gap of less than half a second from third position. Nevertheless, the 2013 Moto2 World Champion remains fully confident of being able to climb through the field tomorrow and clinch a high scoring finish aboard the Yamaha YZR-M1.